For the chicken skewers, place the skinless, deboned chicken thighs in a bowl. Pound the 15ml (1 tbsp) cumin seeds with a pestle and mortar until roughly ground but not to a fine powder. Sprinkle the cumin seeds, smoked Spanish paprika, dried oregano and 2,5ml (½ tsp) chilli flakes over the chicken thighs, then drizzle generously with olive oil and toss to coat the chicken. Season to taste, cover with cling film and allow to chill in the fridge until just before frying. For the beans, heat a drizzle olive oil in a frying pan over medium heat. Add the garlic, 10ml (2 tsp) cumin seeds and ground coriander, and fry, 3 minutes, before adding a pinch chilli flakes, the red kidney beans and the store-bought salsa. Just before serving, heat up the mixture, then stir through a handful fresh coriander, lime juice and season to taste. Returning to the skewers, heat a frying pan over high heat and place the chicken thighs in the pan once it is hot. Fry, tossing, until the chicken is just cooked through, about 5 – 7 minutes. Thread the chicken onto skewers to serve. For the egg pancakes, whisk all of the ingredients together until smooth and well combined. Heat a non-stick frying pan sprayed with cooking spray over medium heat. Pour a little egg mixture into the pan, swirl to coat the base of the pan, then pour any excess back into the uncooked egg mixture. Cook until the egg pancake is cooked through, about 1 – 2 minutes, flip and cook, a further 1 minute. Remove from pan and repeat these steps until all of the mixture has been used up. 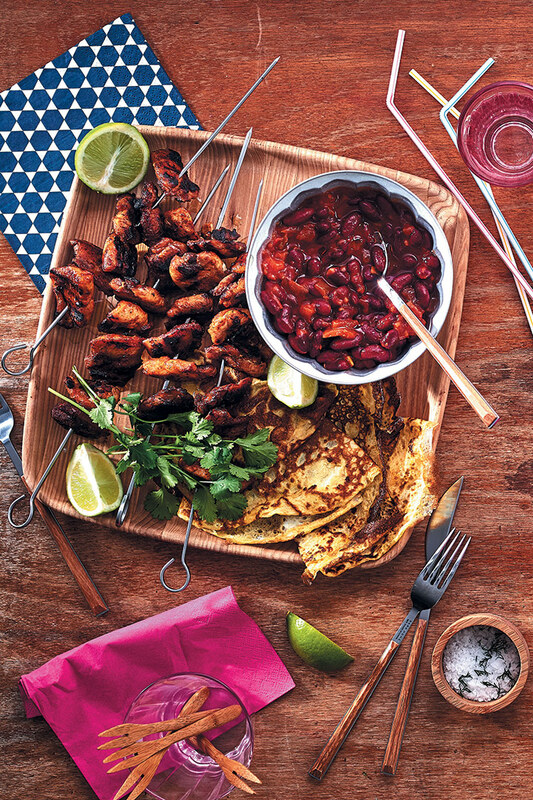 Serve the skewers warm with the quick Mexican beans, egg pancakes, coriander leaves and lime wedges alongside for squeezing.